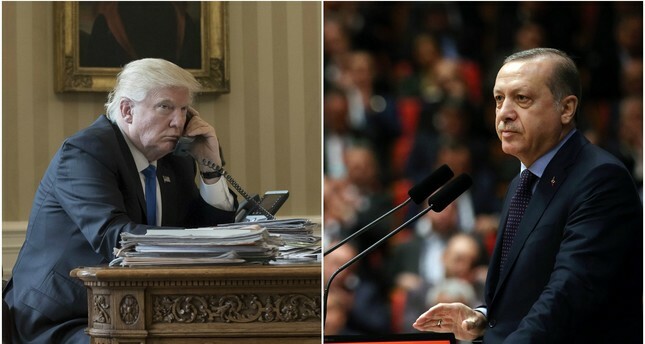 President Recep Tayyip Erdoğan and U.S. President Donald Trump held a 45-minute long phone conversation late Tuesday, their first since the American leader took office. In a statement, the White House said President Trump "reiterated U.S. support to Turkey as a strategic partner and a NATO ally, and welcomed Turkey's contributions to the counter-ISIS campaign", using another name for Daesh. The statement added that the two countries enjoy a "close, long-standing relationship" and they have a "shared commitment to combatting terrorism in all its forms". According to Turkish presidential sources, President Erdoğan underlined the importance of the fight against the terrorist organization PKK and stated that the U.S. should not support its offshoots PYD/YPG. The two leaders agreed to improve bilateral relations and to take joint action in Syria's al-Bab and Raqqa, the source added. Future steps to be taken for economical cooperation were also discussed. Trump also mentioned CIA Director Mike Pompeo's upcoming visit to Turkey. Pompeo is expected to consult the issues of PYD and FETÖ with Turkish officials on Thursday, which will be his first overseas visit since he took office. The Turkish presidency also corroborated the emphasis on counter-terrorism cooperation and on the two nations' "well-established ties as friends and allies", adding that President Erdoğan wished success to President Trump during his term. Turkey's relations with the United States under the Obama administration have been strained, with Ankara frequently expressing frustrations over U.S. reluctance to extradite the leader of the Gülenist Terror Organization (FETÖ), whom the government accuses of orchestrating the failed July 15 military coup, despite an extradition treaty signed between the two countries. Gülen has been residing in the U.S. since 1999. Another major disagreement between Ankara and Washington is U.S.' support of the Syrian Democratic Forces (SDF), which is predominantly led by the PKK terror organization's Syria offshoot, the Democratic Union Party (PYD). While the former administration in Washington argued that the SDF is the most effective "partner" of the U.S.-led anti-Daesh coalition, Turkey identifies the PYD as a terrorist organization because of the organic links the group has with the PKK, and has declared numerous times that one terror group cannot be used to eliminate another terror group. Turkey, the U.S. and the European Union recognize the PKK as a terrorist organization. The EU and the U.S., however, do not categorize the PYD and its armed wing the People's Protection Units (YPG) as such, even though Turkey strongly opposes any PKK-affiliated group south of its border, both in Iraq and Syria, saying it constitutes a national security threat to its borders. Ankara has voiced a willingness to start with a blank slate with hopes that the Trump administration will not repeat the mistakes made by the Obama one in U.S.-Turkey relations, and expects Washington to extradite Gülen and stop cooperation with the PKK terrorist organization's Syrian offshoot the PYD/YPG.